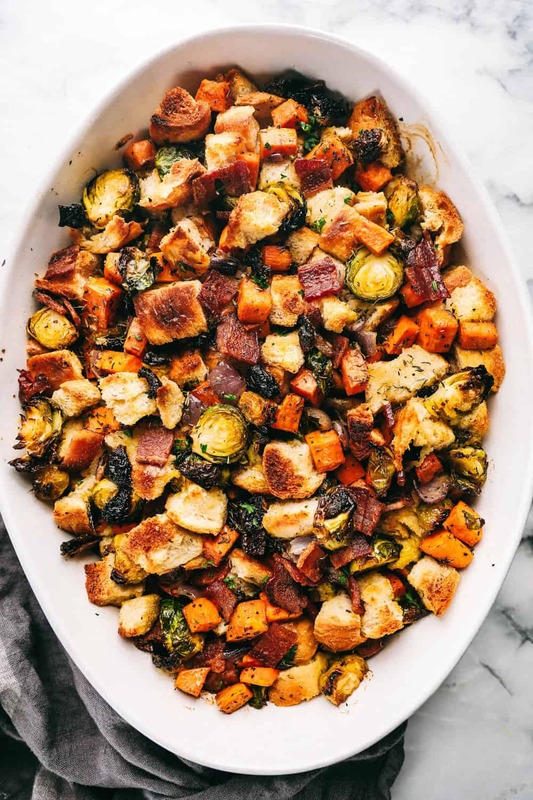 Roasted Autumn Vegetable Stuffing is the perfect side dish for your holiday meal. Filled with roasted autumn vegetables and bacon, this is the perfect addition to the dinner table. This is my favorite time of the year. I love the crisp cool air, sweaters and the beautiful fall leaves. Thanksgiving is one of my favorite holidays that I look forward to all year. This is the time for me to cook all of my favorite dishes, and I especially love gathering around the dinner table with family. Everyone has a favorite Thanksgiving side dish, and one of mine is stuffing. 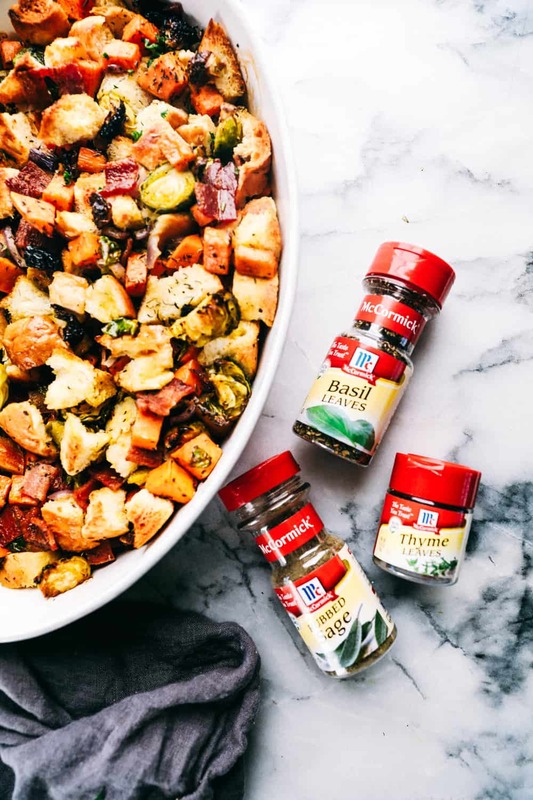 Today I am here to bring you an amazing stuffing recipe that is so versatile, you can change it up to include your favorites. 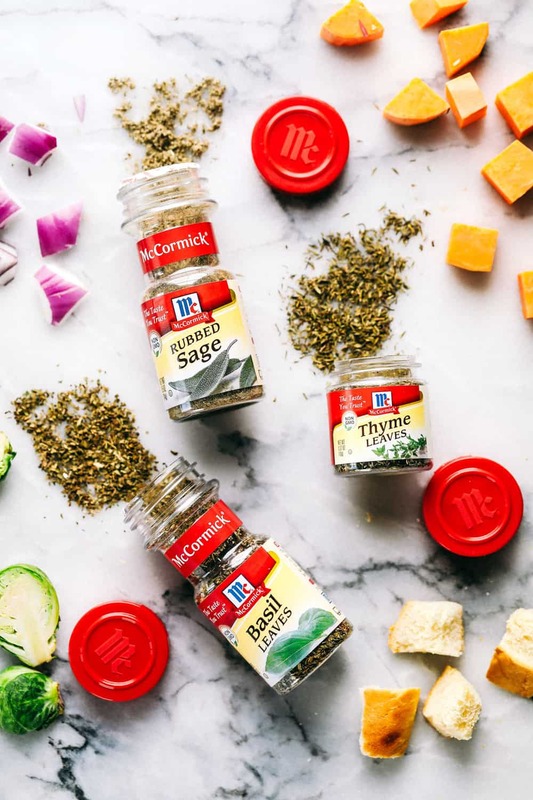 I love using McCormick’s dried herbs in my stuffing. For this recipe, I used sage, basil, and thyme. This brings out such amazing flavor in the stuffing. Not only were the herbs used in the stuffing, they were also used to roast the vegetables. The herbs are so aromatic as the stuffing bakes and it comes out of the oven full of flavor. How do you make roasted autumn vegetable stuffing? To start, prepare your bread crumbs. Cut them into 1 inch pieces and stale them overnight. You can also toast them in the oven at 350 degrees for 10-12 minutes. To roast the veggies. Preheat oven to 400 degrees. 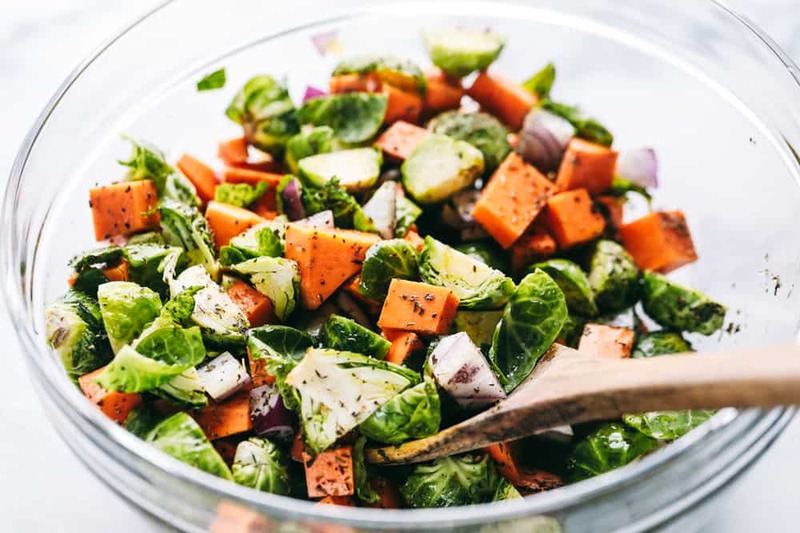 In a medium sized bowl add the Brussels sprouts, acorn squash, sweet potato, onion, olive oil, 1 teaspoon basil, 1 teaspoon sage, and 1 teaspoon thyme and toss to coat. 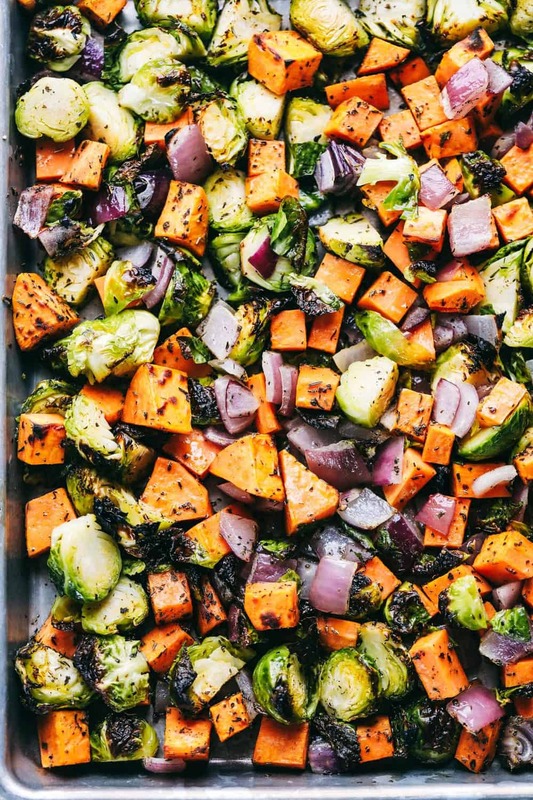 Spread out veggies in an even layer on a baking sheet. Roast for about 20-30 minutes. Remove from oven. 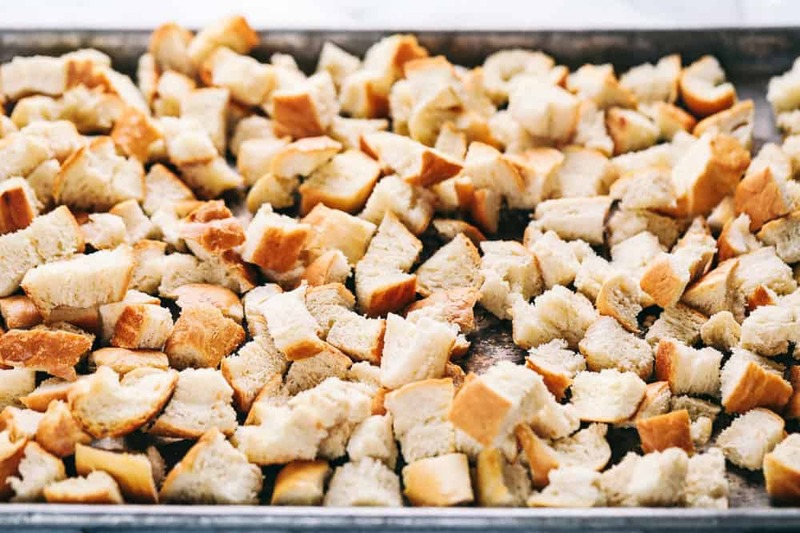 In a large bowl toss bread crumbs, vegetables, bacon, butter, and remaining dried herbs. Spread into a 9×13 inch pan and pour the chicken broth on top. Cover and Bake at 350 degrees for 30 minutes and then uncover and bake for about 10 minutes more. The great about this recipe is that you can customize it to your family’s taste, and it can be made two ways. You can add bacon to one side, with cranberries, and leave the other side with the roasted vegetables. I divided mine with aluminum foil and we make it in two different versions. This stuffing recipe is a great base too start with and make it just how you would like it! 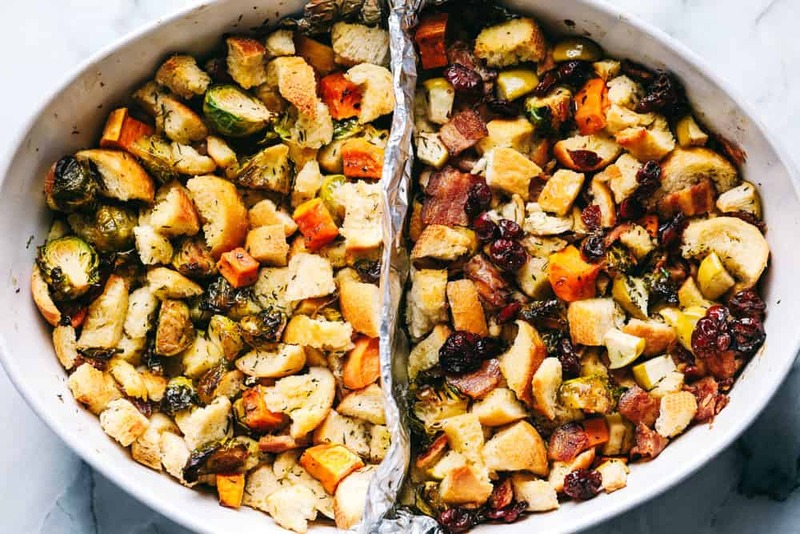 What can you add to stuffing? The great thing about this recipe is that you can customize it to your family’s taste. This recipe starts as a great, basic recipe, and you can add whatever you would like inside. In a large bowl toss bread crumbs, vegetables, bacon, butter, and remaining dried herbs. Spread into a 9x13 inch pan and pour the chicken broth on top. Cover and Bake at 350 degrees for 30 minutes and then uncover and bake for about 10 minutes more. This post was sponsored by McCormick. All opinions expressed are my own. I love working with brands that I use in the kitchen for myself. 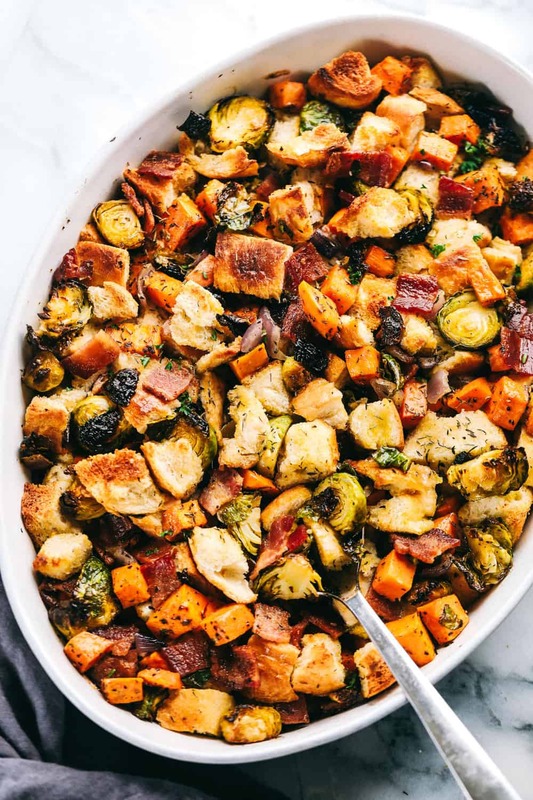 great stuffing recipe, thank you, sweet potato and bacon, wow, among other ingredients including Brussels, wonderful and difference from any stuffing recipe that I’ve ever made so thank you!